Rated M. Starring Jennifer Lawrence, Josh Hutcherson, Philip Seymour Hoffman. Directed by Francis Lawrence. I’ve got to admit straight up that I’m super new to the Hunger Games franchise. I haven’t read the books and I only saw the original film two weeks ago. I think my hesitation in watching these films was that the concept confused me. First I had assumed that it was a Twilight imitation. I was wrong about that. Then I’d heard that it was about a bunch of kids fighting to the death. And in a way, that’s exactly what it’s all about. The Hunger Games franchise is set in a dystopian world policed by Daft Punk, where there’s a massive divide between the rich and the poor. The rich have ridiculous hairstyles and the poor live in slum-like conditions. For entertainment, the rich watch The Hunger Games where the poor are conscripted to become pawns, targets, victims. Sequel Catching Fire follows a similar formula to the first film. People are ‘reaped’ to play in the games, they train for the games, and then compete in the games. But I think everything here is done bigger and better. The cinematography is at a greater scale and more engaging. We get to go deeper with the characters and their relationships. And the Games themselves become more dangerous, daring, and bloodthirsty. As Catching Fire begins, our hero Katniss is troubled by the post-Games life. She stands as a heroic winner of the games, yet she is opposed to killing people for entertainment. She’s morally against the Games and all that they stand for, and she’s become a symbol of hope for the poor. President Snow (who, of course, has white hair) fears that due to Katniss’ rebellion, an uprising might occur that would cause the system to collapse. So he tightens the reins. He and the Capitol take control over Katniss. Soon, Katniss is ‘reaped’ to play once again – but this time for the Quarter Quell, or so it seems, The Hunger Games: All-Stars. All the while though, Katniss questions the ethics of the Games and stands opposed to it. Although the concept of the Hunger Games is crazy, I think we’re meant to be outraged by all that happens. Our hero who stands for what is right is controlled and restricted. The rich stuff their faces with food while the poor starve. 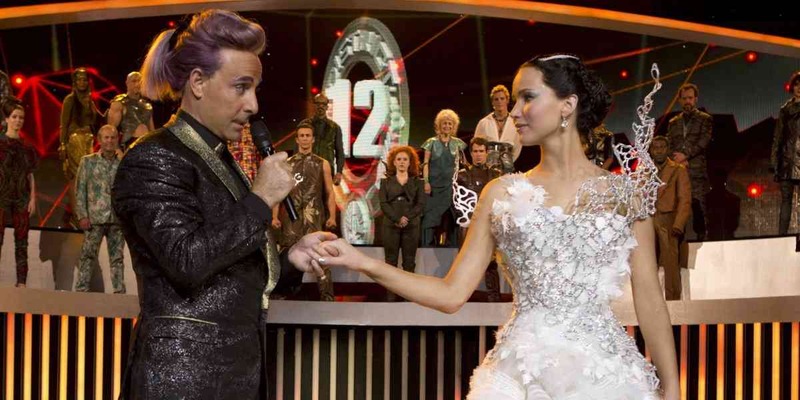 TV host Ceasar Flickerman cackles at the fact that all but one will die in the Hunger Games – ‘It’s exciting!’. During the Games those playing God in the control room send plagues to kill people off. Electrical force fields, poisonous fog, bloodthirsty baboons! It’s brutal, it’s unjust, and it’s terrifying. I love the TV show Survivor, but if this is what it’s going to evolve into, we should be afraid. The Hunger Games is an outrageous game of survival. It’s right to feel outraged. It’s all about death! Unjust death. Death is a terrible thing. Death is offensive. Death hurts. Especially when it’s forced upon often helpless people like this. This got me thinking about Easter, which is approaching fast (at least according to my supermarket shelves). It’s a time each year when we reflect on what Jesus did at the cross. He was an innocent man, but he was crucified and killed on a cross by guilty people who enjoyed watching him hang there in agony. It was an unjust and terrible death. Jesus Christ, the Son of God died. And he died for us. And he did it while we were sinners, standing opposed to him. An innocent person gave up his life, and experienced death for guilty people like you and me. But the amazing thing is that he didn’t stay dead. Three days later he rose again. This gives us hope. In Catching Fire Katniss is the symbol of hope in a corrupt world. She shows mercy to others, and fights for change. But the hope that she offers is limited. She isn’t perfect. And she’s constantly affected by the powers above her, and having to perform for the cameras. Fight she might, but the battle still continues. Jesus is a real hope. When we trust in what Jesus has done for us, and call him Lord, we will be forgiven, and live with him forever in heaven. Yes, we’ll die here on earth, but then live eternally. The outrageous death of an innocent man results in guilty people like you and me being forgiven and saved. What amazing news. There’s one point in Catching Fire where a player in the game appears to sacrifice herself to save others. Katniss asks ‘Do you think she sacrificed herself?’ and after thinking says, ‘That doesn’t make any sense.’ In this world where everyone plays to win, why would anyone sacrifice themselves? Jesus dying in our place doesn’t make sense. Why would the God of the universe stoop to our level and become a sacrifice for us? It’s not fair, it’s outrageous, but it’s good news. The Hunger Games: Catching Fire is a sequel that tops the original. I’m giving it four-and-a-half stars out of five. The Hunger Games: Catching Fire is available on Blu-Ray and DVD on Quickflix. Posted in 2013, Film ReviewsTagged Catching Fire, christian, Death, film review, Survivor, The Hunger Games, The Hunger Games: Catching Fire, TwilightBookmark the permalink.